Slender canoes cleave the Hawaiian waters. In the golden light of dawn and dusk, paddlers work in perfect unison, their strokes disciplined, strong, and smooth. 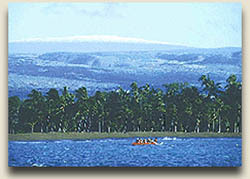 Canoeing, called "paddling" by the locals, has rightfully been named the official state team sport in Hawaii. All paddlers know that the waves, perhaps so calm and blue today, hold their life. A calm surface can change abruptly into a raging turbulence of foam. The laws of nature are unpredictable. All paddlers must learn about the capricious ocean swell, about the wind, and the vastness of the sea. Their guides are the ancient Hawaiians for whom the canoe, small on the infinite ocean, brought life, in the form of fish protein. But that same canoe as easily brought death. Over the last 20 years Hawaii has witnessed a renaissance of its rich ancestry. Skills and crafts that had almost disappeared are taught and honored again. Hawaiians hold unequaled knowledge of the sea. No other culture in history has its roots, its existence and its survival, so intricately linked to the ocean's demands. It's no wonder then, that the ancient mastery of navigation and canoe construction has been revived. More than a millennium before Captain Cook arrived, a group of intrepid people braved the Pacific, looking for land. The voice of the salty water ran through their veins. Without instruments, they traveled at night, when stars guided their way. Their canoes, plank-lashed vessels, yielded to the ocean. They had brought with them livestock, edible plants, and the desire to build a new life. How fortunate they must have felt when they found Hawaii, and, growing on it, the giant koa tree. Now they could craft a canoe hull out of one single piece! Over the years, these first Polynesians established themselves as the Hawaiian people. They developed new skills. And the building of the canoe became a religious task, because they discovered all too soon that on the rough waters surrounding the islands fishing was not all that easy. Every decision and action that involved the canoe could result in death. To survive, the Hawaiian had no choice but to keep building. And to pray, all the time. A new canoe started long before the actual hewing of a tree. A specially trained kahuna (Hawaiian priest), alert to any auspicious or disastrous signs, searched for the perfect site and tree. His guide was the elepaio. This Hawaiian bird was attracted to rotting koa wood, and the kahuna knew not to use it. A healthy tree, which had to be at least a hundred years old to be large enough, could demand a fifteen mile trek inland. Once it was chosen, a group of men hiked over with enough provisions for the work and days ahead. The kahuna stayed throughout because prayers, blessings and invocations had to shower over every detail of the task. Hauling the rough hull to the shore was dangerous. The log, at times weighing as much as 20,000 pounds and measuring up to 70 feet, could drag all the men over a cliff before crashing itself on the rocks below. The ropes with which the haulers guided the descent never slacked. The kahuna chanted and prayed. Safely on shore, the hull was finished in a special halau (canoe shed). A black paint, made out of plants and charcoal, added a waterproof finished layer to the wood. And for the ali'i, the addition of hens' eggs to the paint resulted in a glossy exterior. The final consecration, before the canoes maiden voyage, included the sacrifice of a pig and a dog. Samuel Kamakau, historian and newspaper columnist in the years 1869 and 1870, and often the only remaining source of information on old Hawaiian techniques, wrote: "The pig symbolized the 'rooting' of the canoe into the open sea, and the dog 'the tearing apart' the billows of the ocean". As important as the canoe itself were its many accessories, including the well-known, balancing outrigger booms for the single canoe. Specialized artisans worked on these parts with carefully selected woods. Finely plated lauhala matting created powerful sails, although the Hawaiians relied mostly on their paddling. Those paddles were customized to each owner and each owner cherished his paddle as if it were a lover. It lived inside the house. But what makes the Hawaiian canoe, outrigger (single) canoe or double hulled one, so unique and different from all the other ancient sea vessels? For sure, the Tahitians, and other oceanic people knew equally well how to navigate their seas. Despite today's worldwide interest in Hawaiian canoe racing, and competitors flying in from widely varied cultures, a clear definition has still not been reached. The most distinctive feature of the Hawaiian canoe is the absence of any ornamentation or decoration. No fancy carvings, no extra wood. The furious Hawaiian waters and the pounding surf demanded a clean, streamlined shape, and just as the functions created the god in Hawaii, function also created the form. As for that crashing, legendary surf, it shaped canoe and owner both. Hawaii has by far the roughest waters in the world. The lack of surrounding reefs, combined with a sloping ocean floor and unpredictable winds, causes enormous breakers. There was only one way for the Hawaiians to get their canoe in the water, if at all the water was accessible. They surfed their boat, necessitating smooth and unique lines. 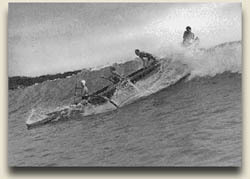 The Hawaiian people themselves were forced to become master surfers. Canoe surfing was a learned skill and grew into a sophisticated sport. Any good king or chief should know how to surf a canoe. It's no surprise that surfing has become Hawaii's greatest pastime. Surfing, in fact, is Hawaii's gift to the world. When Captain Cook arrived in Kealakekua Bay in the year 1779, he reported seeing at least 1500 canoes! At the time, Hawaii must have numbered between 6,000 and 12,000 canoes for a population of 175,000 to 225,000. Here was a culture, who, dependent on the ocean, lived their life around the ocean's vehicle, the ancient canoe. The voice of the ocean was the voice of life. Understanding its language was understanding how to live. This was hard for the white man to grasp. The Hawaiians, always easily impressed with newer inventions, soon lost their taste for their own canoes. They greedily adopted European ways. And while at first they continued surfing the waves and challenging each other in races, the missionaries deeply frowned on this heathen behavior. Naked bodies in water asked for sin, and as far as the gambling that accompanied any sport in Hawaii, that was a route to hell. Gradually, both the Hawaiian canoe and the water sports surrounding it, disappeared. An underground movement, loyal to its past, lived on. King David Kalakaua (1874-1891), known as the Merrie Monarch and determined to bring the Hawaiian culture back to life, named his own birthday, November 16, as the official annual regatta day. After his death, in 1891, interest declined once more, other western sports seeming far more interesting than the old Hawaiian ways of the water. 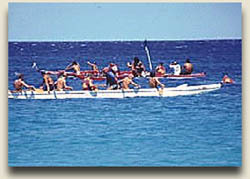 In 1908, the Outrigger Canoe Club was founded. A few water-enthusiasts had remembered the importance of keeping the old knowledge alive. Those early years of the Canoe Club included sailing competitions as well as board surfing and swimming, but it seemed that more and more attention drew toward the slender paddling canoe. Since then, paddling, canoe racing, and recently also sail racing, have grown once again into one of the most popular activities in the Hawaiian islands. Children go out on their boogie boards as soon as parents allow and Hawaii has more than 60 canoe clubs and more than 5000 people are actively involved in the sport. Long-distance races are growing in popularity. What started out as a single event, the Molokai-Oahu race, a grueling channel-crossing, is now one of the most noted annual events. On the Big Island the Queen Lili'uokalani Race between Kailua and Honaunau in Kona has become an 'ocean mark', attracting canoes and their owners from all over the islands. The Hokule'a, named after the zenith star of the Hawaiian sky at night, was built in 1974, according to remaining descriptions of old, double-hulled canoes. Over 60 feet long, the Hokule'a and the Polynesian voyages it has made are more than nostalgic adventures. The canoe has become a spiritual symbol of inspiration and remembrance. It connects Hawaii with a past that was almost forgotten, but must survive. Since the Hokule'a several other models have been built. Paddlers listen again to the voice of the ocean, building their canoes, while never ceasing to sharpen strength and stamina. Hulls are made of fiberglass, but not much else has changed. What makes the canoe Hawaiian? Definitions and rules of competition adapt. But the law of the Hawaiian waters, the pulse of the surf rushing through blood, the knowledge that timing is everything and that life depends on the mercy of the ocean, that will never change. To live in Hawaii, is to learn the ways of the ocean.